I have always loved the story about the eagle who grew up with chickens. Since the little eagle had never seen any of his chicken-friends fly, attempting to do so himself was the furthest thing from his mind. One day, just a typical day on the ground, eating corn kernels and making little foot prints that for some reason looked a little different than everybody else’s, something happened. He saw an eagle flying in the air. “Wooooowww,” he thought to himself, “Man, if only I could do that!” All the while, he was completely unaware that flying was a lot more possible than he thought. It was his innate right. It was his destiny. However, in his mind, he was just a chicken. That’s what he had been told his entire life, and that’s what he believed; so he never even tried. The eagle didn’t have a clue of his own remarkable value. He never knew what it was like to soar. While he was equipped with everything he needed, because of his limited mentality, he never put it to use. Sometimes, the most powerful force against us is our own perception. I think all of us can identify with this story. Some of us sense that there is more to us than people see, than even we can see. We sense that there is more life, more personality, more potential that we just can’t seem to tap into. Wherever we land on the spectrum of self-perception, most of us, on some level, live under the limitation of our own insecurity. Many of us are not operating in the freedom and fullness of life that God intended. This freedom we are meant to have is attractive and contagious. It’s our destiny. You were called to live in freedom. Since it is our calling, it is certainly possible to attain. If only we could see in ourselves what God sees. He sees profound strength. He sees the incredible and unique value that we hold. We were intended to reflect the beautiful image of God like no one else can. Nobody else has the unique personality and candor that you do. In fact, the only way you can be robbed of the freedom, beauty, influence and strength that, by an inherent right you possess, is to be bound in your mind to insecurity. Inflicted in childhood, and honed through adolescence, a façade of limitations has been established against us. The devil has tried to paint a picture in our minds of what he wants us to believe we are. And so, like the eagle and the duckling, we believe a lie. Limited by our own mindsets, we are rendered insecure. We are distracted by a nagging sense of needing to prove ourselves or to measure up. There is a part of us that always seems to compare ourselves to others. Our self-image is far beneath the reality of what God sees, and therefore we carry a weight that drains us like a hole in a raft, and threatens us on a much more serious level than we realize. It doesn’t just put a limit on our livelihood, it is a breeding ground for all kinds of evil. In fact, if you break down every poor decision you’ve ever made, you may find that at the nucleus was insecurity. So how do we find security despite the instability of life? When failure happens and success fails us, when the economy is frightening and the future is unsure, how can we stand strong –on the inside? How can we be truly fulfilled, living to our greatest potential, and making a valid mark on the world around us? We first have to become secure. Our security is our freedom- freedom to be all that we were meant to be. 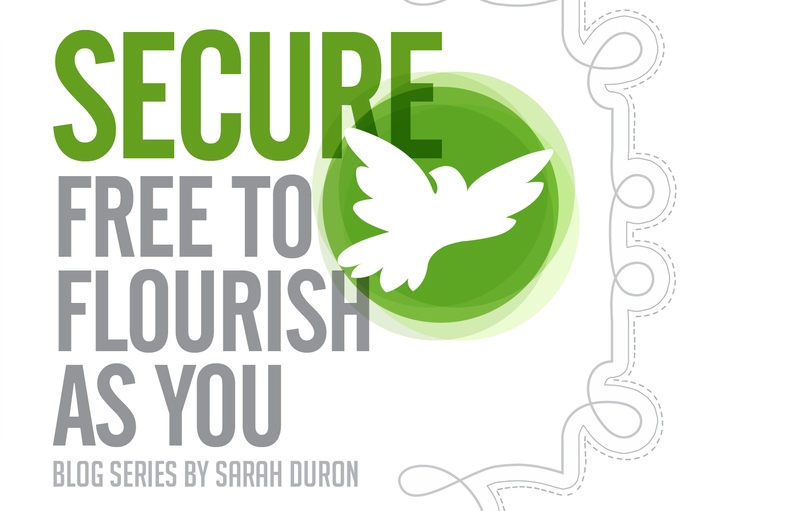 Through this blog series, I want to take a journey with you toward your own security and freedom so that you can flourish as you. Read with an open heart and expect God to bring new freedom and clarity into your life. Combine this book with a daily time of prayer and seek to know God’s heart for you; because at the core of it all, He is the answer.